Foster + Partners has released a futuristic promo trailer for its new London tower The Tulip – a 1,000-ft-tall culture hub that looks straight out of The Fifth Element. Named for its flower-like design, it comprises a tall, slender stem topped by a steel-framed, glass-fronted ‘bud’ which will house viewing platforms as well as skywalks, an education centre, bar and restaurant with 360-degree-views. 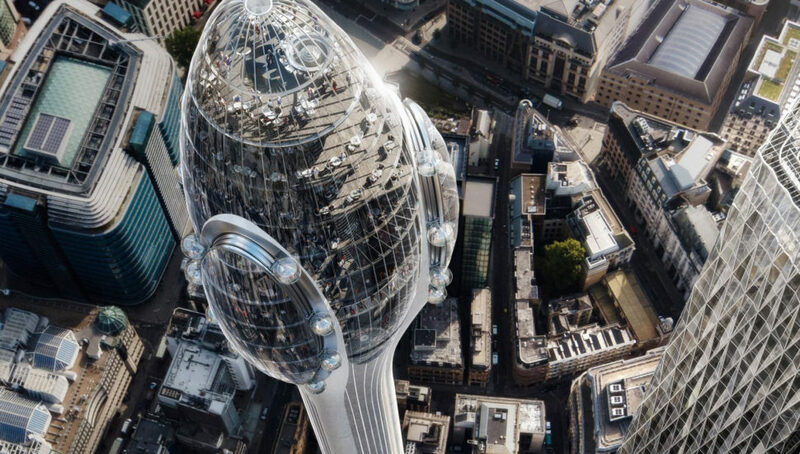 London Eye-style gondola pods will circle The Tulip’s facade, offering tourists birds-eye views across the city. Planning permission for the tower, which is a collaboration with the J Safra Group, has been submitted and if it’s approved, it could be completed as early as 2025. A shave shorter than The Shard, it would be built on the plaza of Foster + Partners’ feted ‘Gherkin’ at 30 St Mary Axe.